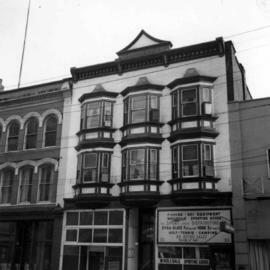 Boy's club in Vancouver, B.C. 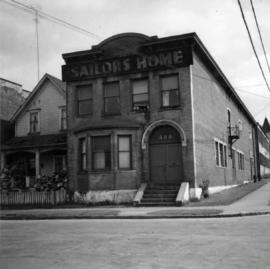 Photograph depicts a former fire hall now used as a boy's club on 12th Ave and St. Catherine's St., in Vancouver, B.C. It is one and a quarter miles southeast of C.N.R. station. 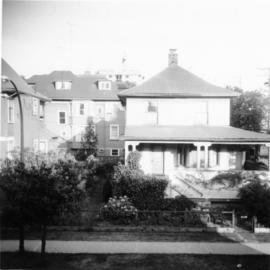 Photograph depicts the Buckingham Apartments at 925 Cardero St. in Vancouver, B.C. after a snowfall. 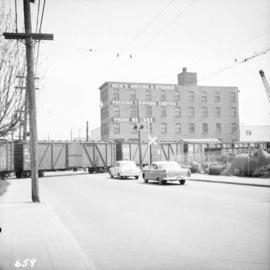 The view is looking south and depicts Barclay St. crossing in the foreground. 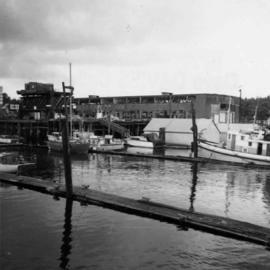 Photograph depicts buildings of the former Vancouver-Lansdale ferry. They appeared to now be used by Kingcome Navigation Co. as well as other businesses. C.P.R. pier A.1. in Vancouver, B.C. 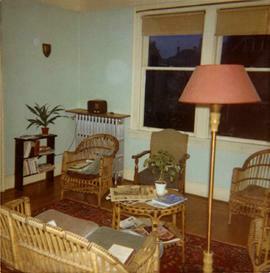 Photograph depicts the C.P.R. pier A.1. 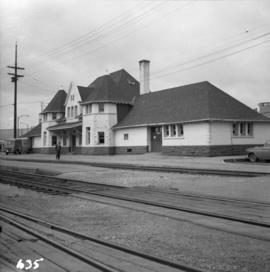 (now 12A) at Vancouver, B.C., slightly right of the foot of Thurlow St. 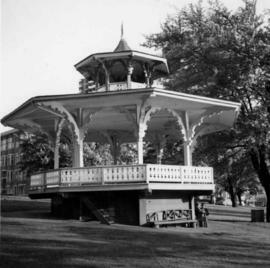 It was built in 1890 and it is still in use. 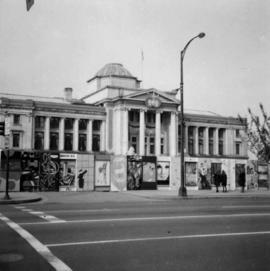 The view shows its east face. 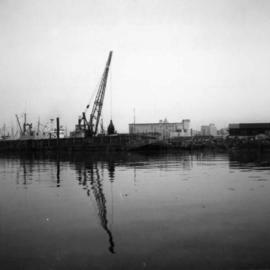 Photograph depicts the seaward end of C.P.R. 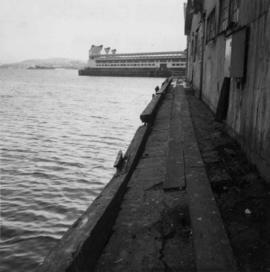 pier A1 (now 12A), showing its rotted condition. 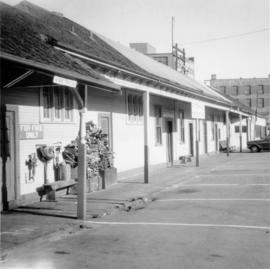 The pier was built in 1890 and is still in use except at this outer face. C.P.R. pier B1 is in the background. 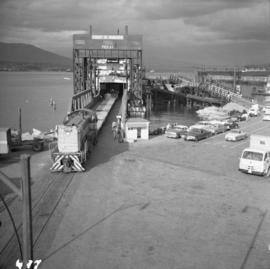 Photograph depicts a CNR lifting bridge in Vancouver. 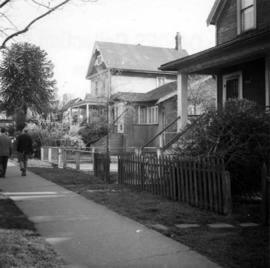 Cadero St. in Vancouver, B.C. 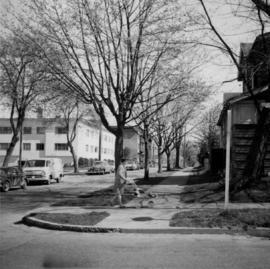 Photograph depicts Cadero St. in the west end of Vancouver, looking north from Barclay St. intersection in the 800 block. 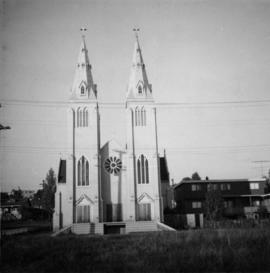 Photograph depicts a church on a reservation at Mosquito Creek in North Vancouver, B.C. Coal Harbour in Vancouver, B.C. 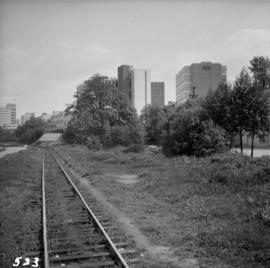 Photograph depicts the west end of Coal Harbour looking south to West Georgia St. and Chilco-Gilford block beyond. The old pilings exposed at low tide. 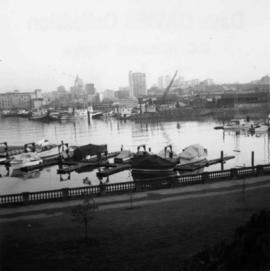 Photograph depicts a general view of Coal Harbour in Vancouver, taken from its head in Stanley Park, looking east. 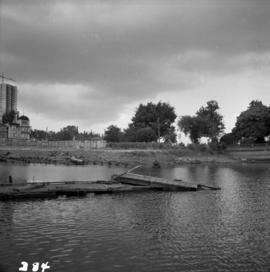 The Bayshore Inn is shown on the extreme left of the image. 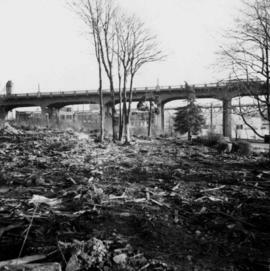 Photograph depicts a general view of the last 300 yards of the upper neck of Coal Harbour in Vancouver, B.C. The view is looking west and taken from the south side. 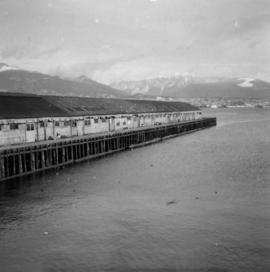 Photograph depicts a general view of Coal Harbour in Vancouver, looking southeast and taken from Royal Vancouver Yacht Club premises. 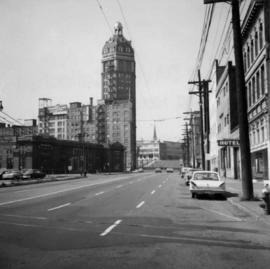 Photo shows the Bayshore Hotel on the extreme left. 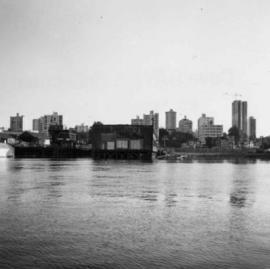 Photograph depicts a general view of Coal Harbour in Vancouver, looking southeast and south with Marine Building (downtown) on extreme left and Stanley Park (unseen) at extreme right. 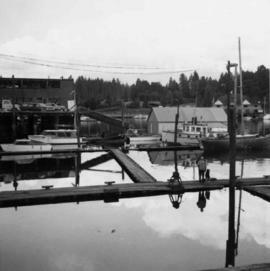 Photograph depicts a general view of the upper and south shore section of Coal Harbour in Vancouver, B.C. 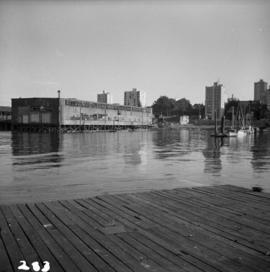 Photograph depicts the upper end of Coal Harbour, on the south shore looking southwest and taken from the dock of the Vancouver Shipyards Ltd. 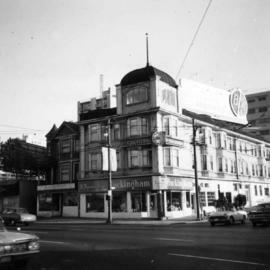 Photograph depicts a corner building on Chilco and West Georgia St. facing Stanley Park in Vancouver, B.C. The view is looking east across Chilco St. 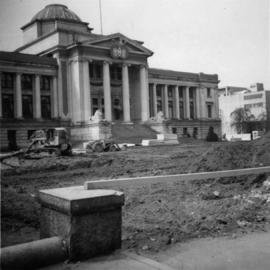 Photograph depicts a courthouse in Vancouver, B.C. surrounded by a fence with paintings. 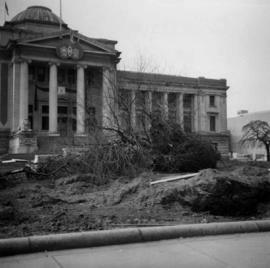 Photograph depicts a courthouse in Vancouver, B.C. Photo shows the ripped up forecourt. 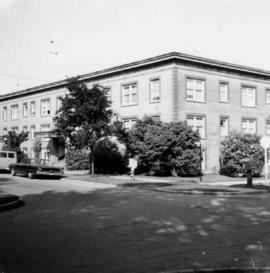 Photograph depicts a courthouse on Howe St. in Vancouver, B.C. 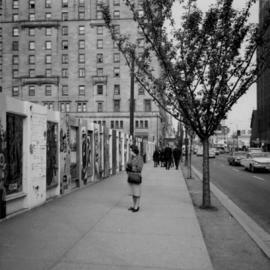 There are paintings on the fence surrounding the forecourt. 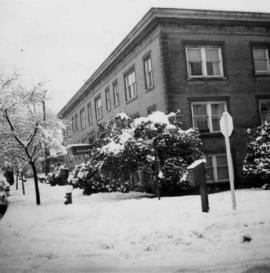 Photograph depicts a courthouse on Georgia St., looking west towards the Vancouver Hotel. The fence surrounding the courthouse is covered with paintings. 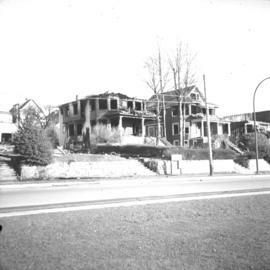 Photograph depicts houses being demolished on Beach Ave, West End, Vancouver. 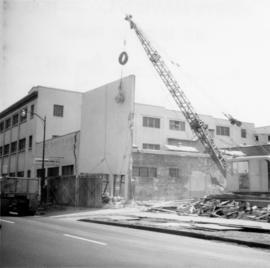 Demolished site of Nelson Laundries Ltd. 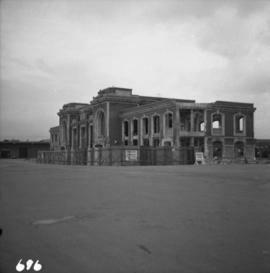 Photograph depicts the demolished site of Nelson Laundries Ltd. The boiler in the foregorund was having tubes removed by a wrecker. 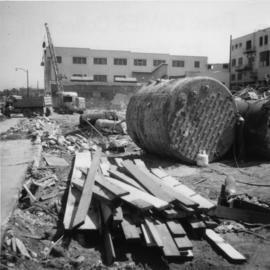 The site was to be occupied by a Ford motor dealer. 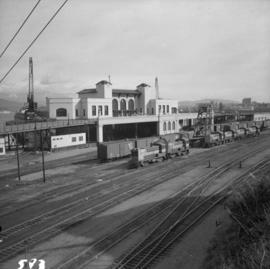 Photograph depicts the demolition of a Great Northern Railway depot in Vancouver. 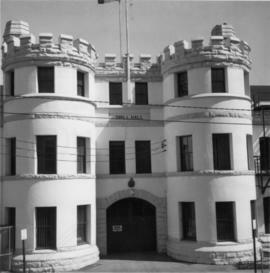 Photograph depicts the Department of National Defence Armoury headquarters of the British Columbia regiment. Dredge working in Coal Harbour, Vancouver, B.C. 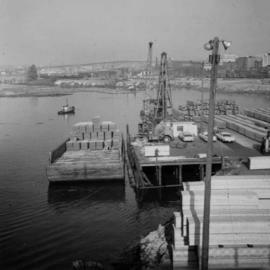 Photograph depicts a dredge working on the shoreline of a new apartment site on the south side of Coal Harbour, Vancouver, B.C. 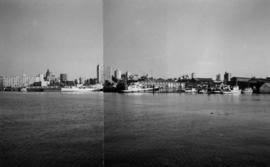 Photograph taken from Stanley Park, looking east. 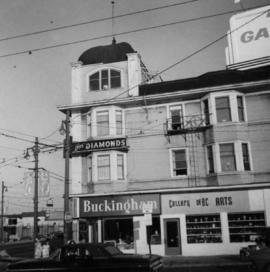 The Bayshore Inn Hotel is shown in the rear center. 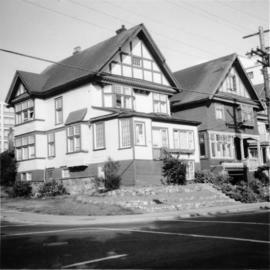 East Pender St., Vancouver, B.C. 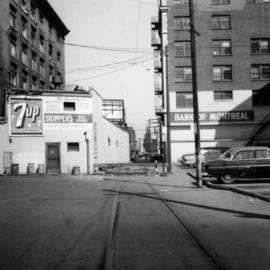 Photograph depicts East Pender St., looking west towards the Vancouver Sun newspaper office near Abbot St. in Vancouver, B.C. Empty site at Beach Ave. in Vancouver, B.C. 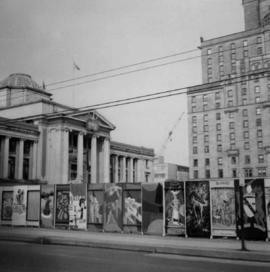 Photograph depicts an empty site at 1000 Beach Ave. in Vancouver, B.C. False Creek in Vancouver, B.C. 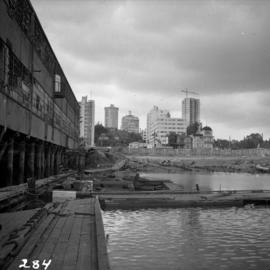 Photograph depicts the north bank of False Creek in Vancouver, B.C. 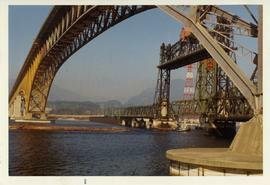 The photograph was taken from the Cambie Bridge, with a view looking west. 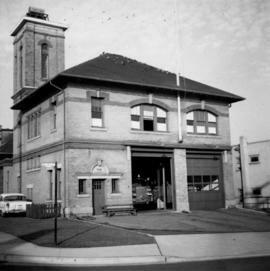 Fire hall in Vancouver, B.C. 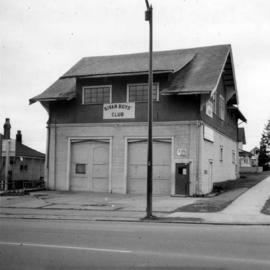 Photograph depicts a west end fire hall in Vancouver on Nelson and Nicola St.
Former C.P.R. connection in Vancouver, B.C. 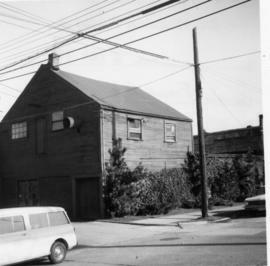 Photograph depicts a frame house in Vancouver. 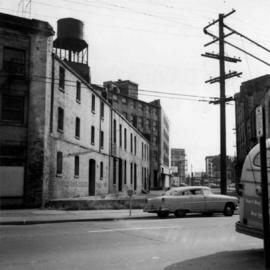 A high rise apartment on Barclay Street was being built and was just appearing in the background. 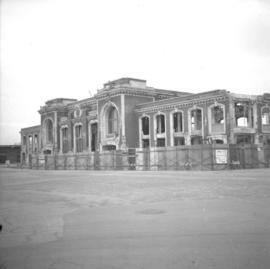 Photograph depicts the Great Northern Railway station on Main Street, Vancouver being demolished.